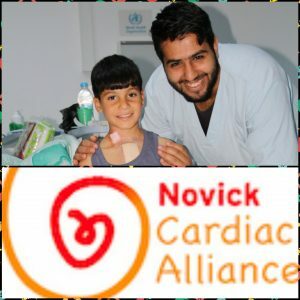 The U.S. NGO Novik Cardiac Alliance to continue its free childrens’ heart operations in Tobruk, but Tripoli’s failure to pay for basic costs halts operations there (Photo: Novik Cardiac Alliance). A team of foreign heart surgeons led by American Dr William Novick is again travelling to Tobruk to perform a series of operations on Libyan children with cardiac problems. The team of foreign medics performs the operations for free but expects the Libyan authorities to pay for travel, accommodation, equipment, medicines, disposables etc. The William Novik Global Cardiac Alliance started the Pediatric Cardiac Surgery Program in Benghazi on 17 March 2012. It made 13 trips to Benghazi Medical Centre and operated on 284 children. The foreign medical team was in Benghazi when the airport was closed in May 2014, and as a result moved the project to Tobruk at the request of the eastern Minister of Health at the time, Reida El Oakley. The team has made a total of 9 trips to Tobruk and operated on 301 children since the programme began in February 2015. Deputy Minister of Health for the east, Saad Akoub, has continued the programme. The foreign medical team is in the process of training a Libyan team in Tobruk which is slowly coming together. However, the medical team is hoping disruptions secondary to funding are minimized in this program. With regards to launching its programme in Tripoli, and after successfully performing hundreds of operations in eastern Libya over a number of years, the Novik medical team was contacted by the Presidential Council in Tripoli in 2017 asking them to start a similar programme in Tripoli. In June 2018 the team was finally able to start its programme of operations in Tripoli. The programme was supposed to run for a year in two phases. The first phase running from June to December 2018 and the second phase from February to July 2019. During the first Tripoli phase from June to December 2018 the medical team made 5 trips to Tripoli. They report that the operated on 153 children and conducted another 4 ASD closures in the catheterization lab. This brings the total number of Libyan children who had been operated on since the Novik team started in 2012 to 738 and with another 4 cath lab ASD closures bringing the total to 742. The Novik medical team will arrive in Tobruk on Sunday hoping to conduct another 35-40 operations during the next month in Tobruk. However, sadly, the team will not be returning to Tripoli due to the failure of the Faiez Serraj administration to pay the basic costs of the Novik medics. It must be recalled that foreign medical team conduct their charitable work in Libya despite their countries’ official security advice, warning them not to travel to Libya. The NGO only operate on children because they feel that children are ‘’innocent victims of wars’’. The programme provides heart surgery at an average cost of $5,000, letting families stay in Libya, saving travel and accommodation costs, and providing education and experience to the local Libyan team. It is an extremely cost effective programme that is providing life-saving cardiac surgery to children. It is also transferring knowledge by building a local Libyan medical team which would carry on the programme of operations without the need for help from overseas medics. Talking to the Libya Herald in July 2017, the then eastern Libya Health Minister Reida Oakley said that Novick and his surgical team of 17 had saved Libya a lot of money. “In their latest visit they did 40 operations at a cost of $100,000, which covered travel, supplies and food and accommodation. The price of just one of those operations would have been around $70,000”. Novick, a professor of surgery at the University of Tennessee founded the William Novick Global Cardiac Alliance in 1993. In the past 22 years he and his volunteer teams have worked in more than 30 developing countries and treated approaching 8,000 children for a wide range of heart ailments. The normal practice is for the charity’s team to focus on a country for at least three years with between two and four visits every year.